The first tennis professional tournament on turf courts in France. Few weeks before the Wimbledon tournament, tennis players can train at the Lawn Tennis Club Deauville Normandie. The Lawn Tennis Club Deauville Normandie organizes every year after the Roland-Garros a preparatory professional tournament to Wimbledon. The ambition of this tournament, played on an innovative turf court, is becoming one of the main tennis tournaments in France. It gathers at first amateur players participating to the Circuit National des Grands Tournoi français. Then, some of the best French professional players will compete too. Michaël Llodra is the new director of this tournament. This young retiree of the ATP circuit, winner of 5 singles and 26 doubles at the ATP tournaments, including Wimbledon, is managing the only tournament in France played on a natural turf court, his favourite surface. At the same will take place the female version of this tournament, the Open du Calvados. The final match is scheduled right before the men’s tournament, on Saturday, June 16. Myrtille Georges won the first edition of the Open du Calvados in 2017. 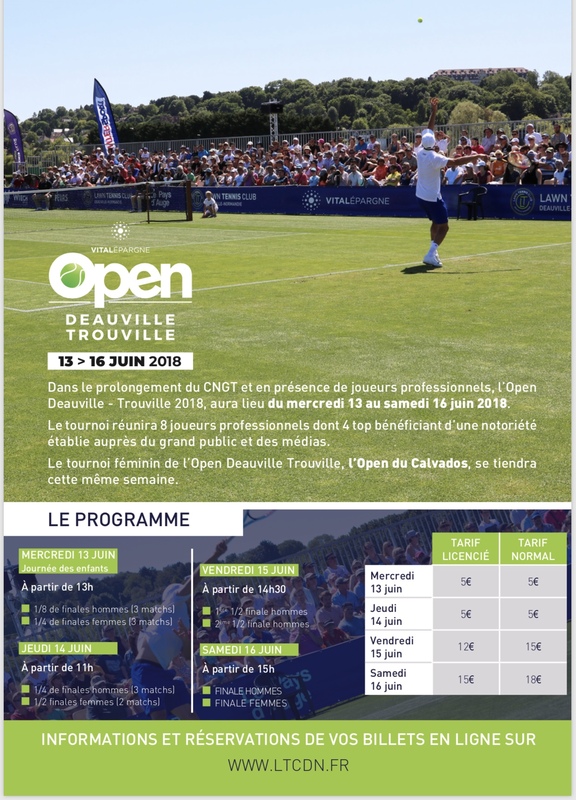 The Lawn Tennis Club Deauville Normandie organized this tournament to let as many people as possible discover natural turf courts. That’s why Wednesday will be dedicated to the tennis schools of Normandy and Thursday to students. Initiation to tennis on natural turf, several activities, meeting with professional players and Open matches will be organized.